April 7, 2014 — Tataviam artifact found during the 1970 UCLA dig at Elderberry Canyon. Today the site is underneath the Castaic Reservoir (i.e., the manmade Castaic Lake). On display at the Pyramid Lake Visitors Center, where the description (probably by SCV historian Jerry Reynolds, who worked there and placed it there) reads as follows: "Ceremonial Bar — A shaped and ground slab of schist — function unknown. 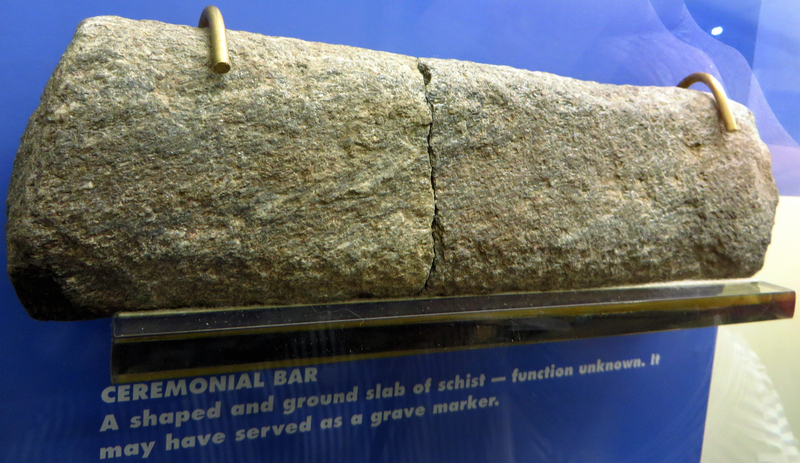 It may have served as a grave marker." Length is about 10 inches. The 1970 Elderberry Canyon dig, on land that would be submerged under the Castaic Lake Reservoir's Elderberry Forebay the following year, was funded by the California Department of Water Resources and conducted by archaeologists from UCLA and CSUN (then San Fernando Valley State College) under the auspices of the UCLA Archaeological Survey. • Ericson, Jonathon E., and Clay A. Singer 1971. "Geoscience at Castaic Creek Site, CA-LAn-324." Manuscript on file, UCLA Archaeological Survey Clearinghouse, Los Angeles. • Loetzerich, Roscoe M. "The Elderberry Canyon Site (CA-LAn-324): Like the Titanic; Submerged, But Not Forgotten" (CSUN 1998). The present writer has never seen either one. Thus, the best I can do here is construct an ex post facto field journal entry. I was 7 years old when I accompanied my mother (Connie Worden, an archaeology student in college) on this dig. Important things I don't know are who was in charge, and exactly when and where it was, although I have to think it was on the former Cordova Ranch, portions of which DWR purchased for the reservoir. We excavated (removed artifacts from) at least one prehistoric dwelling. Cremated remains were found nearby. I don't know how far the interment site was from the dwelling(s). It didn't seem far. According to Johnson (pers. comm. 2013), "Most Uto-Aztecan groups in California practiced cremation, so it is not surprising that the Tataviam did so, as well. It is interesting, however, that some non-cremated interments have been recovered from earlier in prehistory [at other sites], so cremation may have been a relatively late development in the territory inhabited by the Tataviam." I remember the adults saying I was having "beginner's luck" in finding an abundance, perhaps a majority, of the artifacts. I unearthed many examples of both manos and metates (before 3,500 years ago) and mortars and pestles (after 3,500 years ago). I think the mortars outnumbered the metates. I don't specifically recall arrow points, but I distinctly remember finding at least one obsidian spear point (3-4 inches? 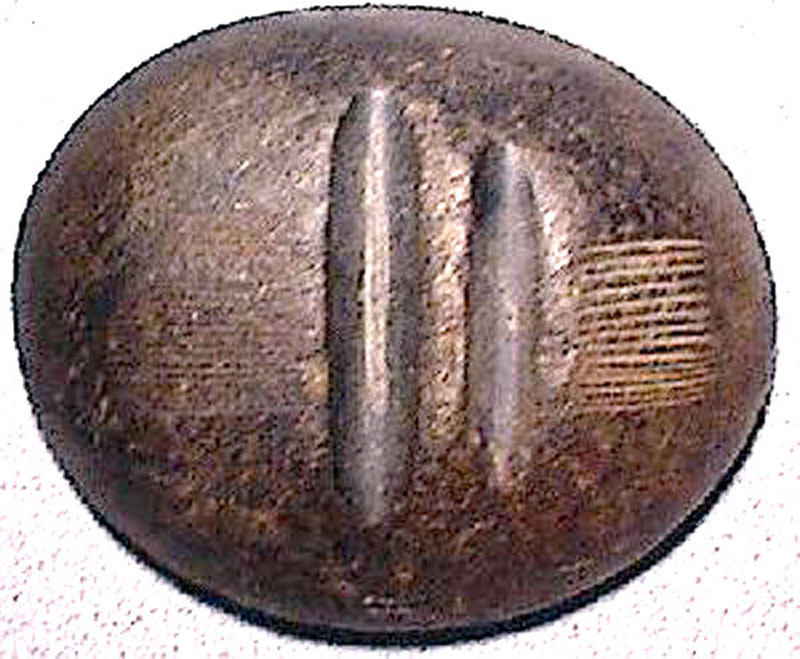 ), indicating trade with the east prior to 800 years ago when the importation of obsidian ended (Whitley & Simon here). The presence of multiple shell beads indicated trade with the west. I unearthed a cluster of small (5mm?) perforated steatite beads, which would have been used as some sort of personal ornamentation. Today they are displayed on a string, as a bracelet, at the Santa Clarita Valley Historical Society's museum in Newhall. According to SCV historian Jerry Reynolds (in "Ethnography of Castaic"), 70 artifacts were recovered from the site — although I doubt that number includes individual shell and steatite beads and other small ornamental items, which were often counted by volume back in the "bad old days." Reynolds was employed by DWR as the tour guide at the Castaic Lake Visitors Center, which probably opened concurrently with the reservoir on June 3, 1972. Reynolds was also the curator of the Santa Clarita Valley Historical Society, which incorporated in 1975 and established a museum inside the Saugus Train Station in 1980. Somehow Reynolds gained possession of some of the 1970 Elderberry Canyon artifacts and displayed a few of them at each of these two locations. After the Castaic Lake Visitors Center closed, he transferred those artifacts (and his job site) to the Pyramid Lake Visitors Center. The artifacts remain on display at each of these locations (Pyramid Lake and the Historical Society). Reynolds died in 1996. As for the majority of the artifacts, their location remains a mystery. They could be in a basement at CSUN or UCLA or Cal State Fullerton; at some point over the past 43 years I came up with the idea they might reside at U.C. San Diego. LW2597a: 19200 dpi jpeg from digital image by Leon Worden.